This R&D program has the aim to reduce the risk of damage caused by groundwork (excavation, foundation and construction work) during and after execution of a project, and the risk of damage to neighbouring structures. The primary objective of BegrensSkade II / REMEDY is to integrate foundation engineering and risk assessment and management, to reduce the technological and economic risks of damage caused by groundwork. This R&D program has the aim to reduce the risk of damage caused by groundwork (excavation, foundation and construction work) during and after execution of a project, and the risk of damage to neighbouring structures. The project has 18 partners representing all stakeholders within the building and construction sector. The Research Council of Norway (RCN) is supporting the work through the programme for "User-driven Research Based Innovation (BIA)". The RCN support is crucial for this sector-wide cooperation and for the realization of the project. The primary objective of BegrensSkade II / REMEDY is to integrate foundation engineering and risk assessment and management, in order to reduce the technological and economic risks of damage caused by groundwork. To achieve this objective, geo-research is needed on the causes of excessive settlements and other damage triggers, and new guidelines and requirements for design and construction are urgently required. The research will lead to more efficient and more reliable design and construction. BegrensSkade II / REMEDY has the potential to realize cost savings of billions of NOK annually in the building, construction and property sectors in Norway. BegrensSkade II / REMEDY is a further development of the previous BegrensSkade R&D program. See more information about the project background. The project has 18 partners representing all stakeholders within the building and construction sector: contractors, consultants, suppliers, property and project owners, public organizations and insurance companies, as well as research organisations. Each industry partner will contribute a total cash funding of 300 kNOK over five years. 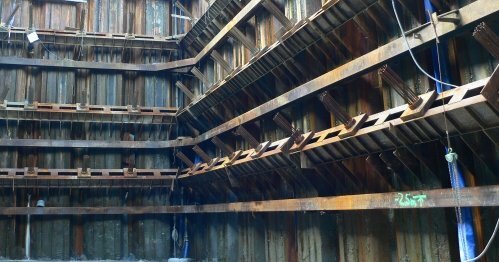 Drilling for foundation piles and supporting tie-back anchors for sheet pile walls, causing erosion, disturbance and drainage which in turn causes reconsolidation. Drainage towards excavations causing pore pressure lowering and settlements of soft clay. Lack of assessment of the risk involved in different solutions. Methods for deep excavations where there is an increasing need for unconventional (new) methods for larger and deeper excavations than earlier. Vibrations after-effects of construction activity, e.g. rock blasting, hammering, compaction or pile driving. Each of these situations are encountered in building and construction projects presently underway in Norway. damage from vibrations due to construction activity. The figure below illustrates the project structure, including surrounding constraints and expected impact. BegrensSkade II / REMEDY project, with surrounding constraints for building projects and expected impact. BegrensSkade II / REMEDY is a research project conducted via the Research Council of Norway's (RCN) programme for "User-driven Research based Innovation (BIA)". Norwegian Geotechnical Institute (NGI) is RCN's contract partner and will – as the coordinator of the project – have the overall responsibility. SINTEF and NTNU will be NGI's research partners in the project. The project has 18 partners representing all stakeholders within the building and construction sector. The project has been organised with one Project Manager and one Deputy Project Manager, one steering committee and a scientific Advisory Group. The project board comprises one representative from each partner and one representative from the Research Council of Norway. Deliverables from the REMEDY Project will be listed here (reports, aricles, presentations etc. ), with link to the publication, if appropriate and possible.